What to Think About When Ordering Security Apparel | Ace Uniform Services, Inc.
Make sure you are investing in your security apparel by thinking about these factors. 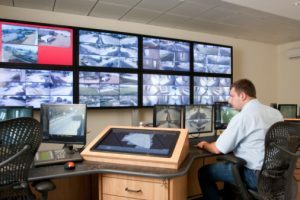 When it comes to the safety and security of your company, your security guards are some of your most valuable employees. A security guard is always on alert to make sure everyone on the premises is safe, and all equipment and information are secured from anyone who potentially intends to break in. To meet proper security needs for your company, you will need the proper security apparel. The best way to make sure your security guards can fulfill their jobs to the best of their capabilities is by making sure they are well equipped with the proper security apparel. Make sure you are investing in your security apparel by thinking about these factors. One of the first things you need to think about your security apparel is the materials that are being used for it. You will want your security apparel to be comfortable and made from breathable materials to make sure security guards are comfortable while on standby, especially if they are outside on a hot, summer day. If they remain comfortable and can perform with the materials used, that is how they will be able to do their job more efficiently. Cotton would make for a terrific material for security apparel as it is breathable and can help stabilize your body temperature. Another aspect that is important for security apparel is that they need to protect those wearing them. Without the right security apparel, your security guards can find themselves in tremendous danger. You will want to make sure your security apparel is prepared to protect your guards from hazardous objects, fire, and water hazards. Like the cost of any uniform, security apparel costs can vary a lot. Depending on the manufacturing, materials, and design customizations, the cost for security apparel can either be surprisingly low or extremely high. If you are on a budget, you will want to think carefully about what you want out of your security apparel. Security guards, perhaps more than any other employee, need to be easily identifiable. In the case of an emergency and a security guard is needed, you do not want them to be dressed in the same uniform as every single other employee. You will want security apparel to be distinctive from any other apparel in your surroundings, so that way they can be easily and quickly alerted when need be. When people see your security apparel, you want them to realize and associate them with security needs at a glance. This entry was posted on Friday, October 12th, 2018	at 12:18 pm	. You can follow any responses to this entry through the RSS 2.0	feed. Both comments and pings are currently closed.